What if I told you the best parts of Deadpool 2 had nothing to do with the antagonist 20th Century Fox has been psyching everyone up for since last November? Or furthermore, since the post-credits scene in the first movie? I'll do you one more even-what if I told you the least interesting parts of Deadpool 2 in fact featured the same guy who was so charismatically devious three weeks ago in Avengers: infinity War? Well, for my money's worth-I'd much rather watch the Deadpool 2 that deals with the titular character figuring out how to balance his sarcasm and wit with that of being a part of something bigger-whether that be with Morena Baccarin's Vanessa or his newly formed X-Force family-but for the movie to go on for long stretches pretending as if Josh Brolin's Cable is a traditional villain in the sense that this is as much his movie as it is Deadpool's and that it is he who we will come to see the merc with a mouth clash with in the unavoidable climactic third act is a disservice to the movie in general as Deadpool 2 is simply better than that. It's better than this because, for a lot of its running time, Deadpool 2 (which is really a missed opportunity in terms of a title, guys-Untitled Deadpool Sequel is where it was at) balances so well the kind of irreverent humor that is the character's trademark and upending the expectations and conventions of the super hero genre in ways that aren't as obvious as one might imagine or as easy as it could be for writers Rhett Reese and Paul Wernick (Zombieland) to default to, but rather Reese and Wernick as well as star Ryan Reynolds, who gets a writing credit on this follow-up, insinuate from the get-go that this isn't just going to give you what you want while upending those expectations, but rather that it's going to do this in a way you don't necessarily see coming. The writers as well as new franchise director David Leitch (John Wick, Atomic Blonde) stick to this main idea, this thesis if you will, throughout and layer in a genuine emotional pull so as to not hang their main character out to dry with little more than the same shtick we've come to expect. That said, there are plenty of laughs to be had here and viewers won't be longing for more of the old because this isn't completely more of the same, but rather there is a more intense satisfaction to be had from the bigger ambitions Reese, Wernick, and Reynolds have for the character this time around. Still, I'd be lying if I said those ambitions don't get away from them throughout the course of this neXt-level adventure. Deadpool (Ryan Reynolds) is back and as provocative as ever. When we talk about sequels there is such a pressure to go bigger, which Deadpool 2 does, as well as this need to up the stakes from the original, which Deadpool 2 does, and then there is the internal conflict we all deal with-including writers and producers- where we want to see all these new characters we loved (or those with cult fan bases) in the comics come to life on the big screen into the fold...which Deadpool 2 does. And so, in all these ways Deadpool's sequel plays into the system in which it both exists and intends to lampoon, but where it deviates is not in the plot it dolls out, but more in how it conveys the story it wants to tell. For starters, the opening sequence of the film and opening credits both quickly establish that this isn't necessarily going to be the sequel we thought we would get. It should also be noted that both the opening sequence and opening credits are both fantastic and nail what it means to define up front what your audience should expect from the rest of your movie. Leitch, who has a long history of stunt work knows his way around an action sequence and while the first Deadpool was impressive for what it was able to accomplish on such a tight budget, it is quite evident from the first time we see Deadpool pull out his katanas that Leitch is working in a much bigger sandbox than Tim Miller was and that money is on the screen. In a relentless montage of the work our anti-hero's been doing since we last saw him we get a DMX-laden, multiple location sequence of well-choreographed and widely captured encounters that, despite not personally being a Deadpool comic book reader, I imagine are pretty damn close to the kind of action that might have been depicted in this character's many runs and what fans of the original comics might have imagined Deadpool embodied on screen to fully be. Take these impressively staged moments and throw in a narrative curve ball that bleeds into a spoof of the opening credits of a James Bond film as set to Celine Dion's gloriously self-knowing, "Ashes" that skillfully brings back the song/movie tie-in the industry has disregarded for far too long now and you're off to one hell of a start. Maybe this is why, after we're given the inciting set-up and slight insight into the probable motivation behind it, the movie feels like it grinds to a halt when it switches timelines and tone to introduce us to a character we've never seen or heard anything about before and, ultimately, don't come to know enough about to care much. This goes for many of the new characters that are introduced in Deadpool 2 as that "X-Force" movie you thought you were promised in the trailers is more of a gag than anything else while more setting up that idea for the next movie than instituting it in this first sequel. The most memorable of the newcomers is Domino (Atlanta's Zazie Beetz) as her mutation is perfect for the world in which Deadpool operates whereas someone like Cable is called out for being so dark that he might in fact be a part of the DC universe. This is a funny if not easy joke to make, but Brolin's portrayal tells us nothing of who this guy truly is, was, or how he became this bionic man of sorts. All we know is that in the future Rusty Collins AKA Firefist (played in present day by Hunt for the Wilderpeople's Julian Dennison) murders Cable's wife and daughter and Cable only has enough juice in his time travel device to travel through time twice: once to the past and once back home meaning he's going to kill Collins even if it means he has to kill a kid. This is all well and good if you're looking for a plot-heavy, futuristic sequel, but Deadpool 2 kind of skimps on the exposition here which is nice in terms of the movie not getting bogged down in the logistics of the repercussions of Cable's actions, but more there isn't enough of it to flesh Cable out either. For those of us uninitiated in the world of the comics, Cable comes off as little more than an archetype of several characters we've seen in the movies before (some of which Deadpool himself references), but while the character slowly comes around and the narrative allows for his arc to take an interesting turn into a more interesting and complex grey area the whole middle section of the film where Cable is persistent in his seeking out of the boy Brolin takes the route of the strong, silent type giving his action scenes featured in this section the same feeling you get when you watch a recent Terrence Malick movie: it looks great and you know the potential is there, but you just don't care about anything happening in front of you. This, unfortunately, makes the much anticipated second coming of Brolin the Offender this summer the weakest link in a movie that otherwise succeeds in every other element that is occurring around him. In short, Cable feels like he's removed from the main throughline of the film and while I understand that the character isn't necessarily supposed to feel like he belongs in the same world as Deadpool, here it never feels as if Leitch or the writers knew how to marry the two in a cohesive or complimentary manner. As much as this would seem to sink any chance Deadpool 2 has of rising above its predecessor the film in fact has so much other stuff going on and keeps the remainder of it in effective enough fashion that the whole Cable the Detractor deal more or less keeps it on par with the original in terms of quality as one of the more outstanding virtues of this sequel is just how daringly different it means to be in how wide-ranging and emotionally resonant it ends up feeling. Cable (Josh Brolin) is a time-travelling bionic man who comes to the past to wreak havoc in Deadpool 2. For example, the interplay that continues in Deadpool 2 between our title character and his cab driver Dopinder (Karan Soni), his best friend Colossus (Stefan Kapicic), and Negasonic Teenage Warhead (Brianna Hildebrand) as well as her new girlfriend, Yukio (Shioli Kutsuna), all continues in the tradition with which it started two years ago-though they certain cut down Negasonic's screen time rather than attempting to raise her profile as a member of the X-Men. The same goes for Leslie Uggams' Blind Al who serves in much the same capacity as she did in the first film, but is relied on less for the interplay between herself and Reynolds and more for the convenience her situation presents despite the fact her inclusion often times feels forced and a little inconvenient. 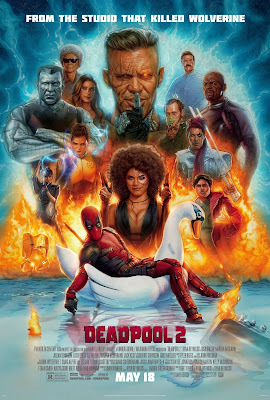 Besides Blind Al though, each of these characters has an arc to take on-even T.J. Miller's less relied upon Weasel has a bit of raw character development here whereas Dopinder and Colossus' arc's and how they play into their evolving relationship with Deadpool is solid, fun stuff. The most interesting new dynamic that comes into play is of course the one between Deadpool and Dennison's Rusty who has reached a breaking point at a local boy's home run by a devious headmaster (Eddie Marsan). In light of this, Rusty is using what are his presumed newly acquired mutant powers to break out of the joint when the X-Men consisting of Colossus, Negasonic, and "trainee" Deadpool show up to try and stop the kid from making a bigger mess than he realizes he's about to step into. From the onset of the first scene in which these two meet one another both Reynolds and Dennison are willing to play the game of matching wits. Reynolds' Deadpool can't figure the kid out beyond his clear justification for wanting to roast Marsan's headmaster whereas Collins sees in Deadpool the first person to ever take up for him, genuinely be on his side, and understand things from his perspective which makes his eventual disappointment in our titular character all the more earth-shattering. Dennison does a fine enough job of managing the range of emotions his pubescent counterpart experiences throughout the course of the film, but it is his scenes where he is able to play off the charming Reynolds that show how much both are up to the task of going back and forth with one another in the battle of wits that both really shine. There is a whole mutant prison section of the film that’s, other than just generally being cool, is key to the foundation of this relationship and Deadpool’s development as this guy who is truly broken and chooses to filter it all through humor. I wish we might have seen more of the one on one interactions between Deadpool and Rusty as this is where the meat of the narrative lays, but to this point-and it feels easy to overlook-Reynolds gives a really solid performance. Sure, the guy is essentially playing a heightened version of his own personality, but when the script calls for Reynolds, the actor, to show up and grow up-he does so in convincing fashion which is more difficult to do with real credibility after making a joke about 90% of the things/events that have come before this supposedly authentically emotional moment. In all actuality, Deadpool 2 ends up feeling like an amalgamation of a few different kinds of movies in order to not feel like your typical sequel, but each of these strands are expertly weaved together by the same overarching needle and the movie is just so consistently entertaining and funny that it’s hard to argue Reynolds and his team didn’t largely accomplish exactly what they set out to create. Also, the mid-credits sequence is perfection.